Can I Replace My Missing Teeth with Dental Implants in Dix Hills? If you are suffering from tooth loss, you need an effective solution to replace your missing teeth. When even one tooth is lost, your oral health and quality of life significantly decline. 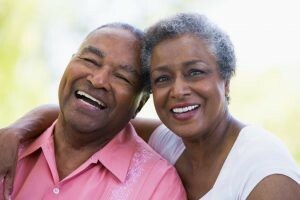 Although you could choose a traditional option for tooth replacement, like dentures or a bridge and crowns, you could choose dental implants in Dix Hills. Dental implants are the most preferred solution for tooth loss because they last a lifetime while offering a 95% success rate. Not only do they restore your oral functions, but improve your oral health. They are the only option that most closely mimics the appearance and function of natural teeth. Endosteal Implants: These are inserted directly into the jawbone through a surgical procedure. Over the course of the next few months, your jawbone fuses to the posts. After the jawbone has healed, a second surgery in needed to connect posts to the implants, which is needed to attach the custom-made replacement teeth. This option can be used to replace one or more teeth in a row. Subperiosteal Implants: This form of implant features a metal frame that is fitted onto the jawbone by opening the gum tissue. After the gum tissue has healed and the jawbone fuses to the frame, posts are attached to the metal. The posts will protrude from the gums to allow the replacement teeth to be attached to the posts. Dental implants allow you to make a true investment in your oral health and quality of life. By replacing both the root and crown of the tooth, you regain healthy oral functions and a complete smile. In addition, by preserving bone density, you protect any remaining natural teeth from damage while giving your facial structures proper support. Due to the materials used and the process to replace the teeth, dental implants will last a lifetime when performed on the ideal candidate. Generally, those who have healthy gums and adequate bone density can benefit from dental implants. However, you will require a consultation to discuss your medical history and lifestyle habits to ensure they are the best option to meet your needs. If you are tired of living with tooth loss or other forms of dental prosthetics do not meet your needs, it is time to see if dental implants are right for you. Dix Hills Family Dentistry provides dental implants to treat all cases of tooth loss. No matter if you are missing one tooth or all your teeth, we have the solutions you need.